Congratulations to knonos for winning the Stikman calendar giveaway! Telegenic acts of iconoclasm: A post mortem on the toppling of the statue of Saddam Hussein in the early days of the Iraq War. And because the world doesn’t have enough art fairs: Brooklyn will now have its own. Ai Weiwei’s studio razed by Chinese authorities. MoMA acquires controversial David Wojnarowicz video, the first institution to do so. It’s the 13th piece by Wojnarowicz to enter the collection. The Civil Rights Movement…in Second Life. On the trail of an elusive forger. Things that look like art. Speaking of which…A Marina Abramovic dessert. A follow up to her chocolate lips. Which makes me think, I really need a signature art-dessert. Ed Ruscha guest DJs at KCRW. The Week in Anti-Climactic Resolutions: Shepard Fairey and the AP settle their dispute. Though still at issue is a copyright infringement lawsuit involving all of Fairey’s “Hope” merch. Photos of Swoon’s completed Konbit Shelters in Haiti. Today’s Graff: Keim & Znjojmo in the Czech Republic, geometry and reflection. Nice. This promises to be all kinds of interesting: The Pruitt-Igoe Myth: An Urban History, a film that examines the social and architectural history of one of St. Louis’s most notorious housing projects. 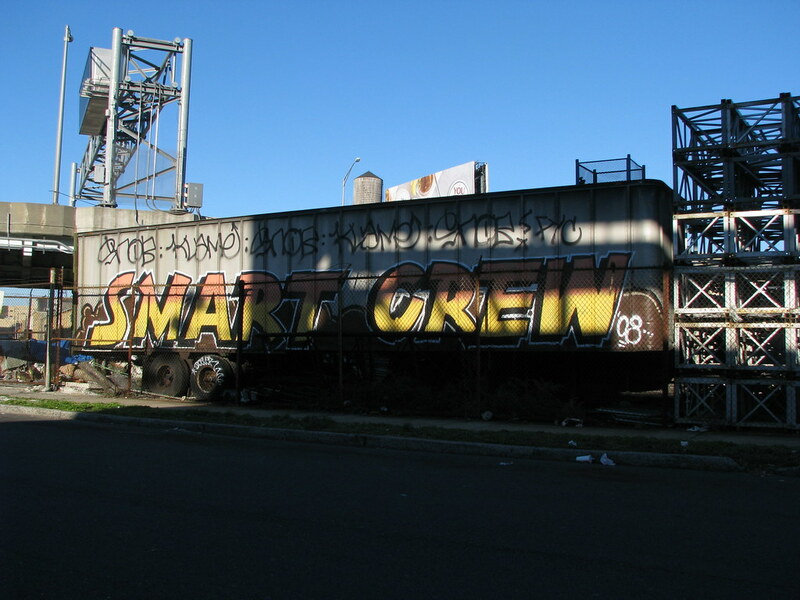 That Smart Crew truck is one of my favorite Queens sights! C-Mon Giveaway Extravaganza: LP Costa Rica.